Took a rare trip last night to see a movie. I was cordially invited to attend a 5:40 PM screening of Friday the 13th with Wes and Chris at the Towne 16 Theater. I went straight from work to meet them there and since I was a little early figured I’d stop at the Shore Mall and grab a quick bite to eat first. I haven’t been to the Shore Mall in quite some time, but wow what a dump that place is. I found myself in fight or flight mode in there, but managed to avoid trouble while eating my two slices. I then entered the desolate theatre. It was kinda strange being the only one in there purchasing tickets. Not sure if it was due to being a Tuesday evening or a sign of the slumping economy. The movie itself was alright. I’ve never really been much of a fan of the whole horror genre. Growing up, Wes would always rent the Friday the 13th films and was very well versed in the history of Jason Voorhees. So he’d probably offer a better review than I, but I though for a cheesy horror film it wasn’t as bad as it could’ve been. 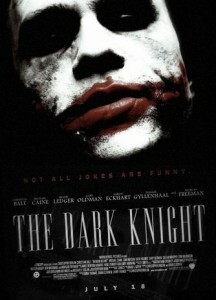 Saw The Dark Knight the other day with Wes, Jared and Chris on the boardwalk in Ocean City. Haven’t seen a movie on the boardwalk in years. The theatre was pretty lousy inside, but it was cool to be packed in there and reminded me of all the movies I’d seen on the boardwalk growing up. While walking there we were the witness to a truly classic event. Chris was delighted to see some money poking up from under the boards. While he eagerly reached down to pick up this monetary gift, so it vanished right before he could get his hands on it. Wow, he’d fallen for one of the oldest of boardwalk pranks. It was great, I couldn’t stop laughing that he fell for it and I’m sure those kids under the boardwalk with the money have quite a tale to tell when they go back to school in a few weeks. I thought the movie was really good. Usually I’ll go see a comic based movie just because I used to be so into comics. And I end of liking them just because I’m so familiar with the characters and stories. But this was a good movie even if Batman and the Joker weren’t in it. The Joker really stole the show. He was dark and twisted, yet comical at the same time. He really made the movie. I wasn’t expecting the whole Two-Face story, so that was a cool surprise too. Very good movie, go see it if you haven’t already. My friends and I stumbled upon another classic film last night. Silent Rage, which starred Chuck Norris. Nothing like watching a Norris film, the man is arguably on of the finest actors to ever grace the silver screen. The film was originally released in 1982, and it shows. From the attire to the hair, clearly the wonderful early eighties. The plot involves the sheriff of a small town played by Chuck Norris who finds himself face to face with an unstoppable (until he met Chuck of course) bionic killing machine. The fight scenes are vintage Chuck Norris. The music is really cool, lots of Casio synthesizers. Unfortunately we did miss the beginning, so I’m not too certain how John Kirby (the bionic killing machine) became the unstoppable force that he was in the film. This was a very entertaining film, mostly for the wrong reasons, but entertaining nonetheless. I’m not sure how or why, but I wound up watching many very bad B horror films this weekend. 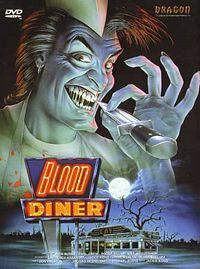 The one that really stood out amongst the crop was Blood Diner. Scott picked it from what was available On Demand, and we all just sat there and watched. Apparently the film was form 1987 and involves two brothers who open a diner and kill people in hopes of resurrecting an Egyptian goddess Shitaar. Oh yeah, under the guidance of their uncles’s brain that lives in a jar. There was also a wrestler by the name of Little Jimmy Hitler. So as I’m sure this post makes no sense, the film made even less. This movie was horrible, one of the worst I’ve ever seen. But the name Shitaar will forever be etched in the minds of those whom braved this film on that night. Looking for a really bad B horror film to laugh at then this gets the highest of recommendation. Was hanging out with the Shepherd this afternoon and while thinking of something to do, he remembered that he had some movie passes that were due to expire soon. It would be just wrong to let something free go unused. So the big decision of what film to witness was now upon us. After seeing that Rambo was showing at 3:50, without a moments hesitation it was decided that the film Rambo would be seen on this day. 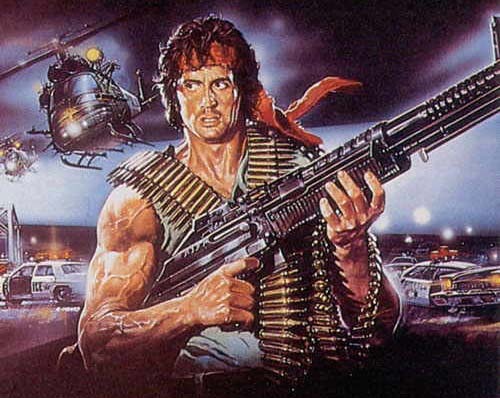 I grew up admiring and hoping to grow up to be a one man killing machine like John Rambo since Rambo: First Blood 2 came out back in 1985 (hard to believe it was that long ago). The movie wasn’t that bad. By no means was it a great film that I would recommend that you must see, but it wasn’t as bad as I expected it to be. Granted it was one of the most violent films I’d ever seen. I couldn’t begin to try to count how many deaths occurred in just an hour and a half, but for an action film it rarely got dull. My favorite scene of all was when he detonated the WWII English bomb with the claymore. It was Rambo carnage at it’s finest.